On Friday night, at 11 30, I lit a prayer candle and prayed to the spirit world. I asked Easter Lily Fryer, a beloved, baby-nurse to help me. She was a loving black woman who had cared for my babies years ago while I was at work. She succumbed to breast cancer some fifteen years ago. I fervently pleaded with this life-long devout Christian to send me Jesus, the Christ. I reminded her that she had known about Christ all her life as a Christian. I had only recently accepted his spiritual possibility, on faith, and only in recent years — by virtue of the power of his name to dispel unseen evil ones. But that's another story. The following Sunday afternoon was Easter Sunday. As the sun set in baffled light through the maple trees in the late afternoon, a song rang in my head. Leaving my house, through the back door, I felt strangely compelled to sit on my front steps. This is something I never do. At first. I couldn't place a song that I began to hear. It echoed in my mind. A Christmas tune? A Christmas song in April? It was the Christmas carol "Oh come all ye faithful" repeated over and over in my mind. Four or five feet up in the air above the front garden suddenly appeared an undeniable figure of a man in dazzling light. A man's figure floating in light! I couldn't shake it. Aware that it might mean something psychically, I frowned into the light, puzzled. A tidal wave of encompassing warmth washed over me. Love, peace, and serenity overwhelmed me. Bliss radiated from this figure of light. Later, I recalled my previous special request, and remembered that it was, indeed, Easter Sunday. I recalled my plea to Easter Lily to assist me. I had heard the song about Christ, had seen the figure of light, and had experienced bliss and rapture. I had observed what I realized later was the Christ-light. Since then I care little for any didactic about Jesus the man. I hum that song when I need reminding of the miracle sighting that I apparently had. painted in 1710 and hangs in the Fitzwilliam Museum, Cambridge, UK. 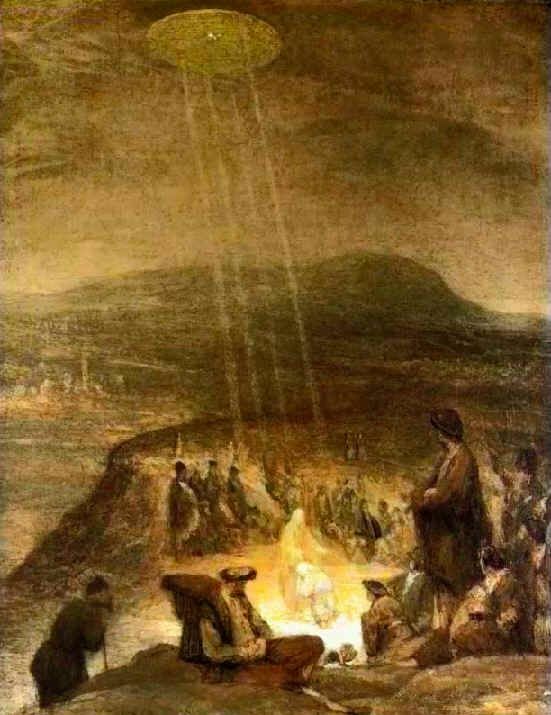 The disk-shaped object is shining beams of light down on John the Baptist and Jesus.